First showing-Monday March 18th. Crescent Hill 3 bedroom 2 bath 2 story nicely updated!! 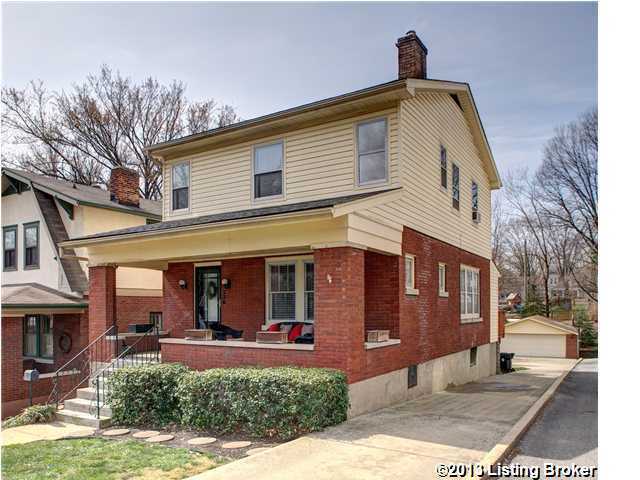 This home has a welcoming covered front porch and is just steps away from Kennedy Park. First floor has a living room w/a decorative fireplace w/ built-ins on either side and unique crown molding. The updated kitchen has white painted cabinets, granite counter tops, stainless steel appliances and a breakfast bar which is open to the dining area or family room. There is also a full bath. Second floor has 3 good size bedrooms and a full bath - the master has a walk-in closet. The lower level is partially finished with a rec room and office area with laundry and outside entrance. Other features include a spacious deck off the kitchen with storage area below and an over-sized 2 car garage. Direction: Frankfort Ave. OR Grinstead Dr. to St.
Crescent Hill is a subdivision within the city of Louisville, Kentucky. There are currently 9 Homes for Sale within Crescent Hill, with asking prices ranging from $219,900 to $449,900. The average list price per square foot of the available inventory in Crescent Hill is $162, which is above the Louisville average of $156. The Average Sales price of all sold real estate in this subdivision for the past year is $332,796. Recent comparable homes have been selling for 97.86% of their asking price. Waterfront homes represent 66.67% of the available Crescent Hill inventory. The population of Louisville, according to the 2010 Census, is 597,337. The total number of households in the zip code of Crescent Hill is 9,488, with an average household size for of 1.92 people. The total number of renter households within the zip code of 40206 is 4,448, which means that 53.12% of households in this zipcode are owner occupant households. , Louisville KY 40206 is a Home, with 3 bedrooms which is recently sold, it has 1,919 sqft, <.25AC sized lot, and 2 Car Garage,Detached,Off-Street Parking parking. A comparable Home, has 3 bedrooms and 2.5 baths, it was built in and is located at 200 N Birchwood Ave Louisville KY 40206 and for sale by its owner at $ 389,000. This home is located in the city of Louisville , in zip code 40206, this Jefferson County Home, it is in the CRESCENT HILL Subdivision, and CLIFTON are nearby neighborhoods.